I am always looking for ways to become more organized, especially in the kitchen in hopes that it makes my life easier. Throughout my time, this is the best recipe organizer I have found to meet my needs. I think it might work for you too. 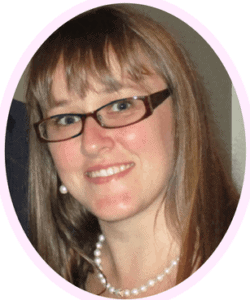 Are you like me and you love finding recipes online? Facebook or Pinterest? But then what? For me, it means I now have a pile of printed recipes shoved in a cupboard. What if you are more of a cookbook lover? Are you keeping an entire cookbook for one or two recipes that you love? Do you have handwritten recipes that have been passed down through generations floating around your kitchen or maybe shoved in a recipe box? 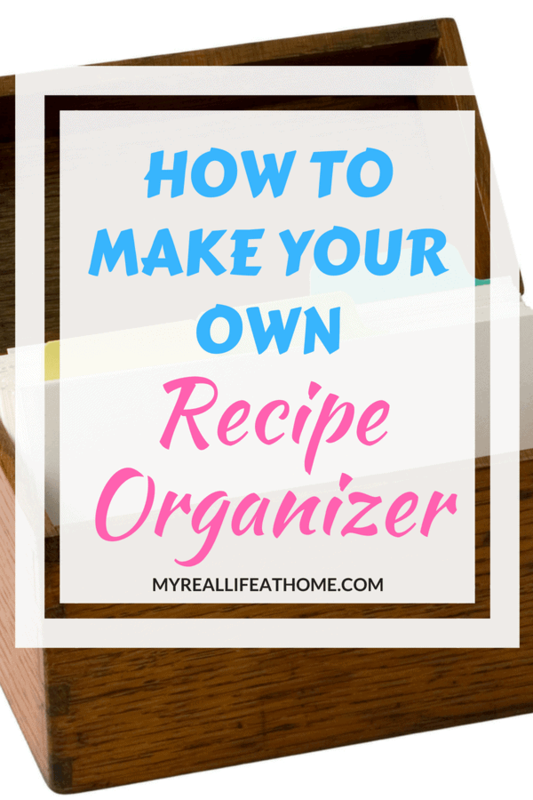 Maybe you have that recipe box and all your recipes are in one place but it’s hard to organize and find that certain recipe that you are looking for. 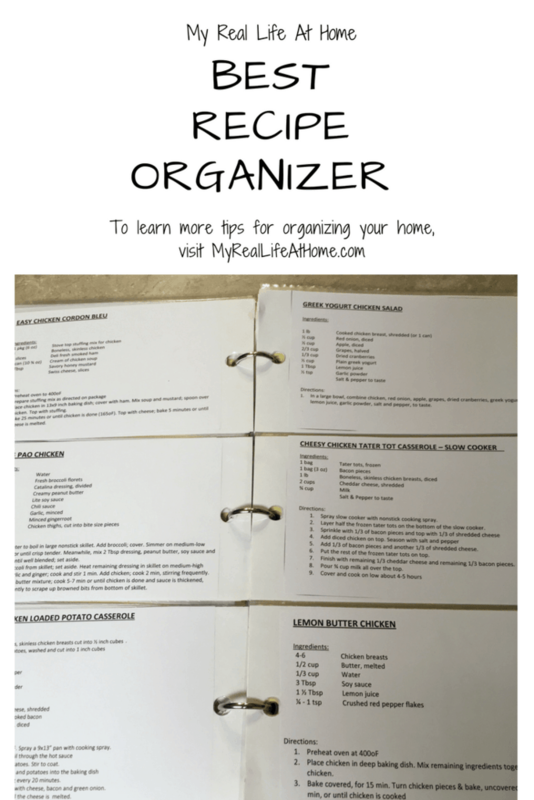 I have some of all of those issues and to me, this recipe organizer solves them all. 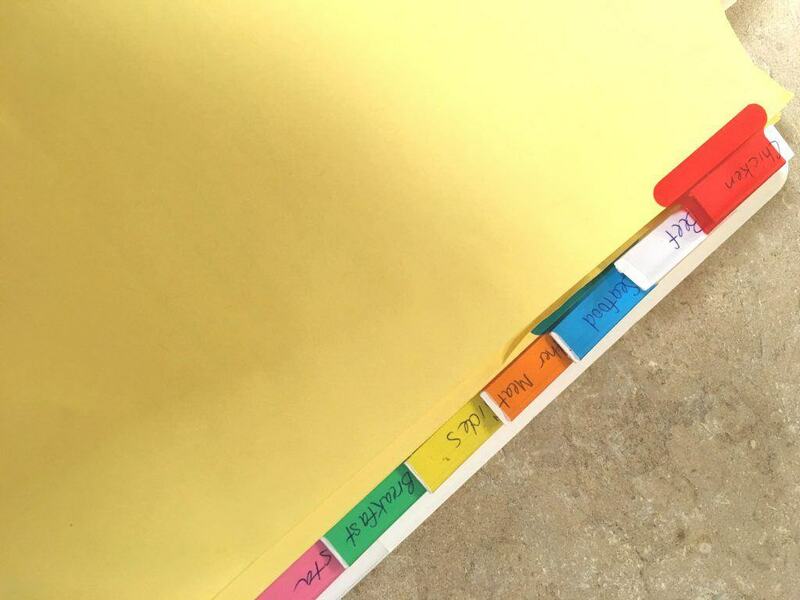 Not only does this recipe organizer fix all those messy, unorganized recipe issues, but I made it at home! It’s super easy and very inexpensive to make. All you need is a photo album, dividers, and a recipe template to print your recipes. You can also use a 3 ring binder and buy some 3 hole photo album sheets. Either way, simple and inexpensive. I print my recipes on plain paper since it doesn’t really matter the weight of the paper since they will be going into your photo sheet. 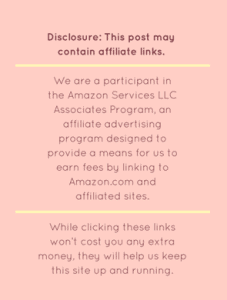 However, you are welcome to use a heavier weight paper like cardstock if you want. Really, the only time-consuming part of this organizer is typing up your recipe. If I am looking online, once I have found a recipe I want to keep, I will print out a copy. (If the recipe is from a recipe book, handwritten or just in your own mind, you can skip this step). Then, I type the recipe into a template that fits the photo album sheet size. I have attached a copy of my recipe template below. 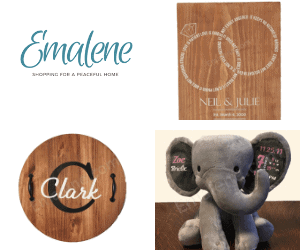 The template is sized to fit 4×6 inch photo album page. Since I print on regular 8.5 x 11-inch paper, I can fit two recipes. 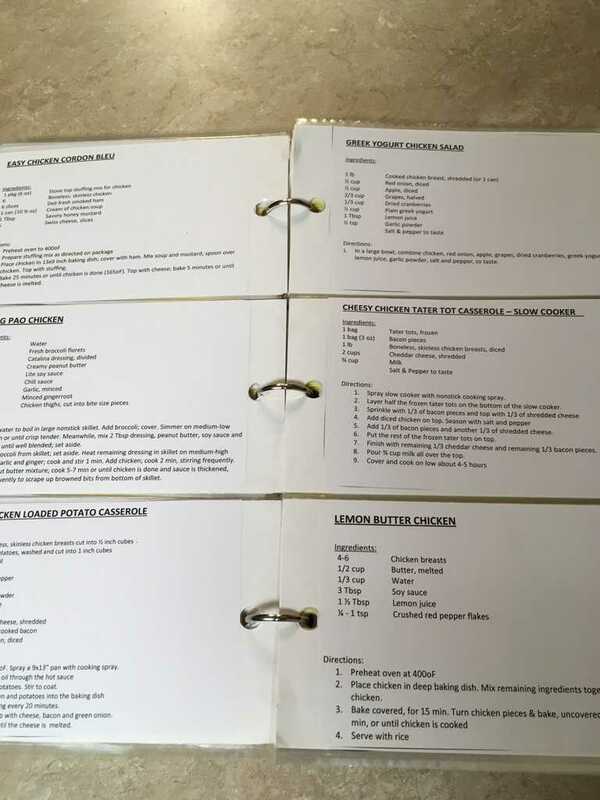 Depending on how long your recipe is, you may have to change the font size on the template or use two 4×6 sheets and just put them right next to each other. Once, I have the recipe all typed up, I print them, cut them out and slip them into photo slot. This is my recipe template. 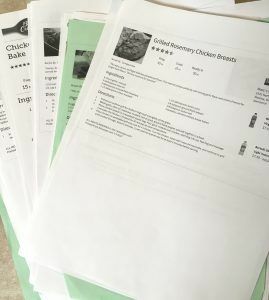 Once you have your recipes printed and cut out, you are going to want to organize them. Remember, that was the reason you started reading this post in the first place. Since I use a 3 ring binder, I bought some 3 hole dividers to organize my recipes. I found this to be the easiest way to separate and organize my recipes. I have my recipe book broken down into quite a few sections but you can have as few or as many as you would like. 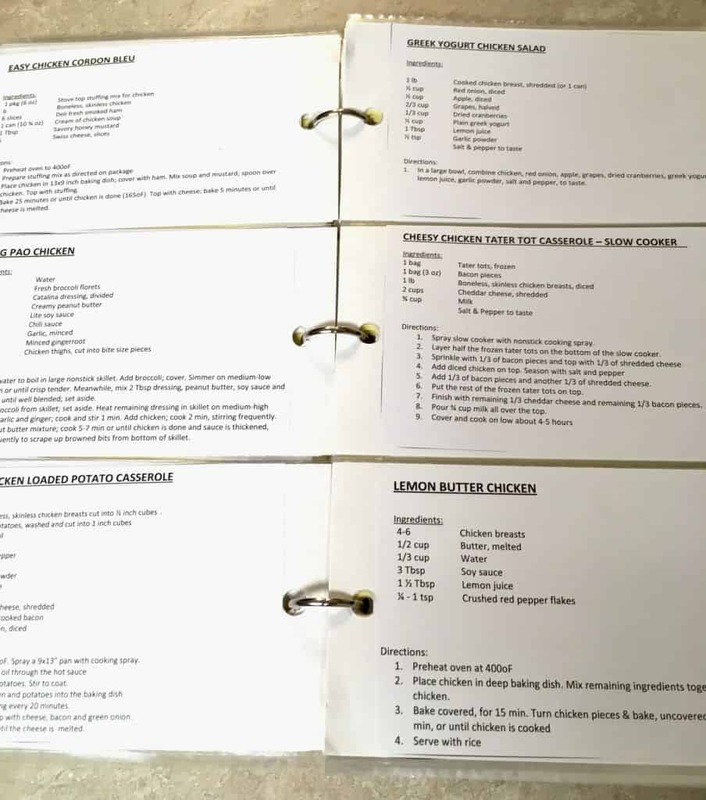 Before you start, you may want to look at your recipes and see what you have and decide how to want to break your recipes out and then how many dividers you would need. Again, you can use these as a starting block for whatever categories suit your recipes. Maybe you want to simplify yours and break them down into meals, such as breakfast, lunch, dinner, dessert, appetizers, etc. Or maybe you make a lot of different cuisines and you want it broken down into American, Mexican, Italian, etc. There is no right or wrong way to do it. Find whichever way works best for you. You may try one way and then as you are using your recipes, discover it would be better a different way. Great! It’s so easy to change. All it requires is changing the names on the dividers and moving around some recipes. No big deal and it probably won’t even cost you a penny. One of the biggest advantages I have found of using photo album sheets is that they are plastic. I don’t know if you are like me but I’m not always the cleanest cook. Even though I try to clean as I go sometimes things happen. The other day, spaghetti sauce splashed over the recipe. So I now have red dots all over my recipe but all I needed to do was grab a paper towel and wipe it off. No staining or having the ink start to run or blur. Definitely a great advantage over paper or a recipe book. Another advantage is that you only have the recipes that you actually want. No more scouring through pages trying to find a recipe you want to cook or having a shelf of cookbooks for maybe 10 recipes out of a handful of books. I had been keeping a large cookbook for literally 2 recipes. Why? My recipe organizer is the same size of that cookbook and I now have all the recipes I need taking up the same amount of space I was using for two recipes. To me, that is a much better use of space and is a much cleaner, organized look. Finally, as I mentioned above, you are able to sort and organize your recipes any way you want. If you want to sort by food or by meal, the choice is up to you. It allows you the ability to customize your organization style and your recipes to whatever works for you. I would love to hear what ended up working for you. I’m sure none of ours would be exactly the same! Now that your recipes are organized and you are able to see the recipes you want to cook, I hope you will find it easier to plan and make meals. 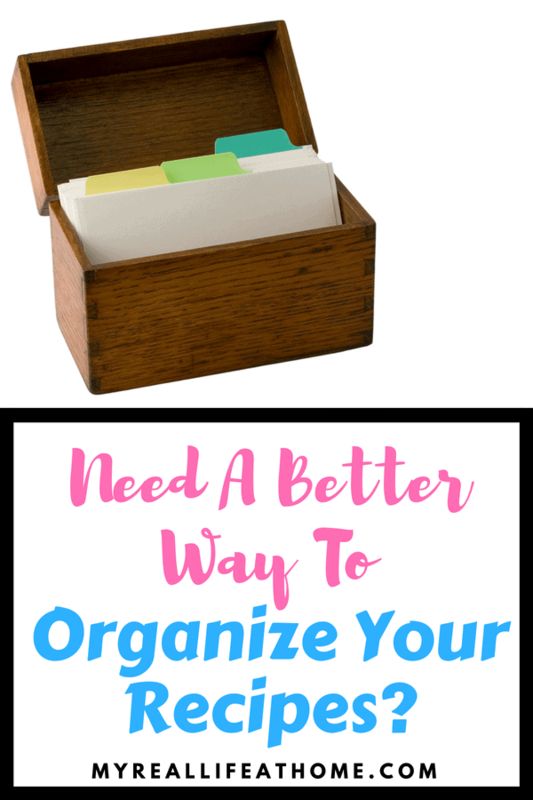 It always amazes me at how being organized can help in so many other areas of life! I would love to hear your thoughts on this recipe organizer and if it worked for you. If you have any questions, please let them in the comment section below and I would be happy to answer them! So glad I was able to help you. I know if I don’t print the recipe, I can never find it online again! You can do it! 🙂 I find it so much easier to plan meals when I have my recipes organized.